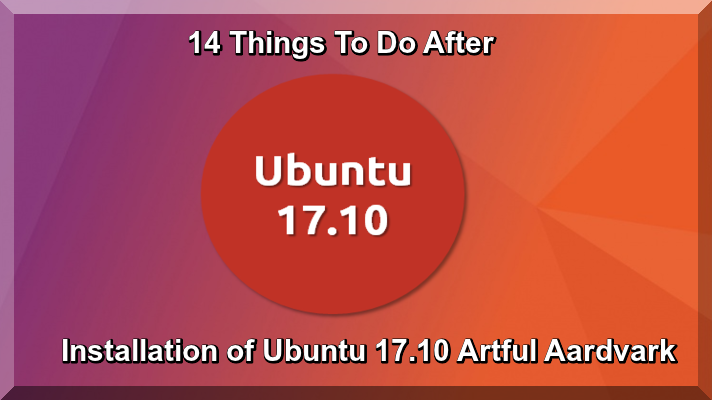 By this useful Article I guide you that how to do some things after installation of Ubuntu 17.10 "Artful Aardvark" was released on 19 October 2017. Ubuntu 17.10 now using GNOME as the default desktop environment halting its work on Unity 8 along with GNOME 3.26. Ubuntu 17.10 will have the Linux Kernel 4.13 providing performance improvement for new hardware support all time. Now Ubuntu has stopped 32 bit installation support, now images for Ubuntu 17.10 32 bit is no longer provided for Ubuntu Desktop. GDM has replaced LightDM as the default display manager. The login screen now uses virtual terminal 1 instead of virtual terminal 7. Now I guide you step by step how to download Ubuntu 17.10 Desktop version on your PC or Laptop. Printer configuration is now done in the Settings app and the Amazon app now loads in the default web browser. The default on screen keyboard is Genome Desktop and also Caribou instead of onboard. Calendar now supports recurring events. LibreOffice has been updated to 5.4. Python 2 is no longer installed by default. Python 3 has been updated to 3.6. Ubuntu 17.10 is new and latest version of Linux you can download it from following direct links, and also you can download BitTorrent. Gnome 3.20 is latest and very popular Desktop latest release you can install it to use following command in terminal. Now you have installed Ubuntu 17.10 and now update it to use the following commands in terminal. It is very easy that the default settings app, which comes pre-installed, doesn’t offer much control over the system. If you want to change the system environment including fonts, window style, animation, GTK themes, icons, then you must install the Gnome Tweak Tool. To use the following command in terminal. Multimedia Codecs are very important for Ubuntu to can install it with following commands in terminal. The following Multimedia codecs are working fine on Ubuntu latest versions, you can you use 3D Movies. At present the default browser in Ubuntu 17.10 is Firefox but Google Chrome is very popular, you can install Chrome, for Linux Basis System from this link such as Chrome .deb file and run the following command after opening a terminal in the file's location. If you are using Nvidia Graphic Card on Ubuntu 17.10, it is extraordinary until the point that you need the most recent drivers particularly when you are a playing game. Not at all like Windows, Nvidia drivers for Linux desktops are very difficult to find, and introducing the most recent drivers on your Linux Desktop can be a significant challenging procedure. Luckily for Linux clients, there are the outsider designs drivers PPA which keeps a refreshed Nvidia driver for establishment. Now visit on PPA Home Page latest Nvidia driver is available which is nvidia-375, or other latest number and now verify that your graphics card is capable of running the latest drivers. If you are using older version of Nvidia driver version use the following command and remove older Nvidia driver. Now add the Graphic Card Driver to use PPA and use the following commands in terminal. Now install and active latest Nvidia Card Driver to use the following command in terminal. Now reboot your system and check the status of your new driver to use the following command in terminal. If the installation has been failed and there is no output of new driver. It is possible that the driver is not available in the database of your computers driver. You can run the following command in terminal and check that system is running on the open source driver nouveau. If the output is negative for nouveau, then all is well with your installation. Ubuntu 17.10 uses default GNOME desktop environment. The default setup looks better, you can change it easily, with some visual changes from the System Settings. First go to search for System Settings in the Activity Overview and start it. After that in the System Settings, you can change the wallpaper of the desktop and the lock screen, you can change the position of the dock (launcher on the left side), change power settings, Bluetooth etc. I think moving back to Xorg from Wayland in Ubuntu 17.10. As Ubuntu 17.10 moves away from the legacy Xorg display server, not all desktop applications are compatible with the new Wayland display server. It is the issues with screen recording tool and apps that depend on geo-location such as RedShift. And for this reason. It should beI switched to Xorg from Wayland. It won’t change anything from the end user’s point of view, so you can be sure that switching to Xorg won’t harm your system. To switch to Xorg from Wayland, log out of your system, at the login screen, click the gear icon and select Ubuntu on Xorg option. Another way is that to use the Xorg backend by default, edit the following line to use as line./etc/gdm/custom.conf file. Linux has huge number of free software available for educational purpose in Software Manager, this is great procedure to install as per your requirement. You can install all of those from the software manager. Now I share most important and best educational software and I guide you how to install through Terminal to use the following commands. Install Marble Marble is working like Google Earth which let the children learn about interactive 3D earth globe, you can use it without any Internet connection. Install Marble: This is very important software. Linux Mint is resourceful and pitch solid safe OS but occasionally the system may get overheated and supply low performances. You can install TLP and Laptop Mode Tools to recover the overall system power management and raise system usability with high optimized performances. Install TLP. After installing the above, now you can get the GUI for further customization, and use the following command in terminal. Now you can install most popular and important software on Linux Mint 18.2 “Sonya”. In this regard I have selected most popular software and they are mostly required to use Linux basis system. Install QBittorrent Client: Install QBittorrent Client Best Torrent Server for Linux and very popular install it to use the following command in terminal. I hope you like this tutorial and install latest version of Ubuntu 17.10.